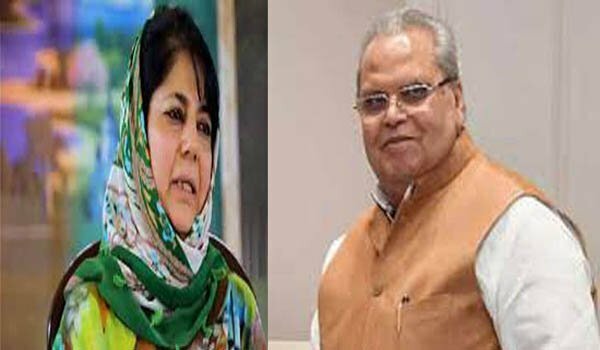 Jammu: A day after PDP president and former chief minister Mehbooba Mufti warned the Governor headed administration, Jammu and Kashmir Governor Satya Pal Malik on Monday said that speaking in favour of militants is their compulsion because elections are round the corner. Ms Mufti on Sunday warned the Governor of dire consequenses in view of alleged harrasment to a family of a militant in Jammu by the police. "I do not mind what she (Mehbooba) has said because she is my friend's daughter but one thing is clear that speaking for militants' is out of their compulsion in view of upcoming Assembly elections," Mr Malik here told reporters on the sidelines of a function this morning at University of Jammu. He however, said that if anything wrong has happened, he will order high level probe into the matter, adding, "we have nothing personal with families of militants and strict instructions have been issued to the security forces to be careful during counter insurgency operations." The Governor however, also termed 2018 year as an overall successful year in many aspects and added, "many halted developmental schemes were resumed and people have started realising that if peace prevails, progress will automatically take place." He said democratic set up was established while Panchayat Polls and Civic Polls were held successfully and peacefully in which not even a casultyof a 'single bird' was reported. A grand alliance formation to make "BJP free Kashmir"